Even though the official start of fall is still a couple of weeks off, here in Orlando it is definitely in full swing. Fall decorations have made it to the Magic Kingdom at Walt Disney World and the first Mickey’s Not So Scary Halloween Party is only days away. Previews have started for Halloween Horror Nights at Universal Studios, while Halloween Spooktacular is only a few weeks away at SeaWorld. Brick-or-Treat at LEGOLAND Florida starts the first weekend in October. Howl-O-Scream kicks off at Busch Gardens on September 25th. With all these awesome events just around the corner we thought we’d share some of our fall favorites. What are you most looking forward to about fall outside the parks? Betsy – This was a tough one for me between pumpkin flavored everything, cooler weather, but ultimately, football wins out. I love college football season and enjoy playing in a Fantasy league for NFL, so it brings that extra competitive edge to the fall. 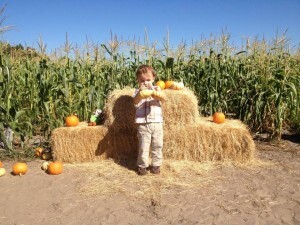 Jillian – I love all the smaller fall festivals the different towns hold, pumpkin patches, corn mazes, hay rides! I love fall! 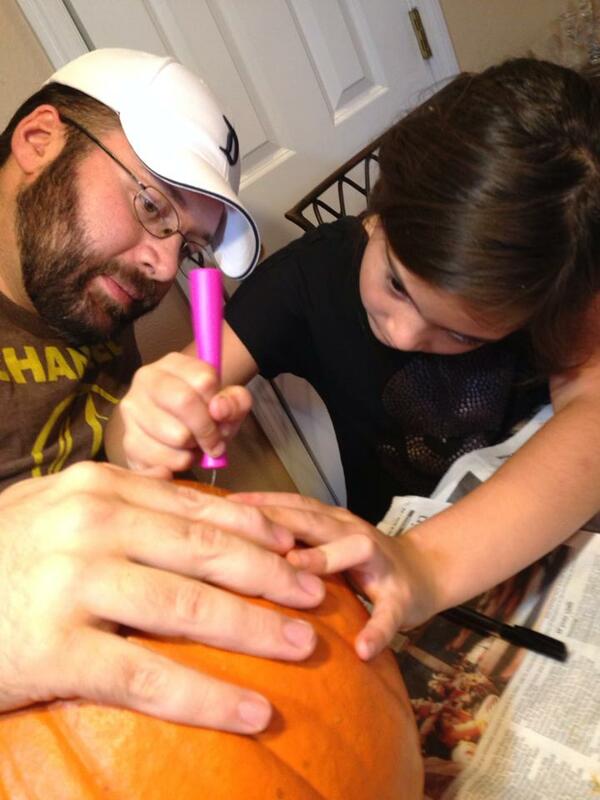 Shelley – Watching It’s the Great Pumpkin, Charlie Brown and carving pumpkins with Dave & Zoe. Jacqui – I’m ridiculously excited about dining at Morimoto Asia in Downtown Disney! A huge fan of Iron Chef ( and all cooking shows) I can’t wait to experience another new culinary gem at Walt Disney World. Gail – What I’m most looking forward to about fall outside the parks is not only the cooler weather and layers, but the food and the sense of family. The tasty fall drinks at Starbucks, the many yummy pies, the feeling of families starting to plan to get together for thanksgiving time. Once it gets cooler I enjoy going outdoors more and seeing the change of colors to the landscapes. What is your favorite thing about fall in the parks? Betsy – Mickey’s Not So Scary Halloween Party is my favorite special event at Walt Disney World, so I always look forward to it. This year I hope to check out Brick-or-Treat at LEGOLAND for the first time, and get to Spooktacular at SeaWorld again. Jillian – The decorations all over the Magic Kingdom, Mickey’s Not So Scary Halloween Party, and SeaWorld’s Halloween Spooktacular. Shelley – The decorations at the Magic Kingdom! I love seeing all the pumpkins! Jacqui – The thing I love most about Fall in the parks is EVERYTHING….lower crowds, cooler weather, a decked out seasonal display at MK….and of course, my fave at EP, the Epcot International Food & Wine Festival! Kelly – I love the decorations in the Magic Kingdom, especially the themed jack-o-lanterns on Main Street. Gail – My favorite part of fall in the parks is the decor! Disney magically transforms to leaves and pumpkins and orange all around! Universal Studios has Halloween Horror Nights which is my favorite! Then all the local haunted houses are so fun to find. Not forgetting the pirate house at Celebration that he decorates every year, it’s truly a sight to see AND hear! What are you planning on dressing up as for Halloween or what was a favorite past costume that you wore at any point in your life? Betsy – I will probably not dress up this year because I find it still a bit warm, but I can usually be counted on to wear a fun t-shirt. 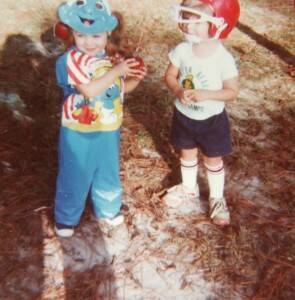 My favorite costume growing up was probably when I was a Smurf when I was about four. I’m short and blue is my favorite color, so it works. Jillian – Haven’t decided what we’re doing for costumes this year. Past favorites have included Snow White, and Kaylee from Firefly (and Serenity). Shelley – You’ll just have to wait for this year’s costume!!! Dana – My favorite past costume was Dr. Facilier, a female version. 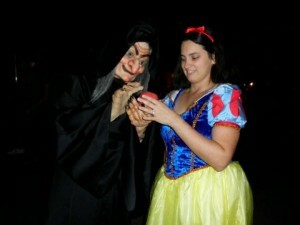 Jacqui – I’m still deciding on a possible costume for this year, but my fave costume was Snow White. My toddler and I both dressed as her and the memories of that day are nothing short of magical. Kelly – Not planning on it this year, but if I was I would probably be Sadness or Disgust from Inside Out. In the past, a group of friends and I dressed as Wizard of Oz characters. I was Scarecrow. Gail – I don’t tend to dress up much for Halloween, just accessorize but my favorite outfit is my pumpkin outfit, it’s so silly but I love it! Cheryl – I have no idea. What is your favorite fall food or drink? Betsy – Almost anything pumpkin flavored, especially my beloved Pumpkin Spice Lattes from Starbucks. I also really enjoy a nice glass of apple cider with a hint of cloves and cinnamon either hot or cold. Shelley – My favorite fall food is the Halloween Sugar Cookies that Zoe and I make every year at SeaWorld’s Halloween Spooktacular. Can you see the cookie underneath all that candy??? 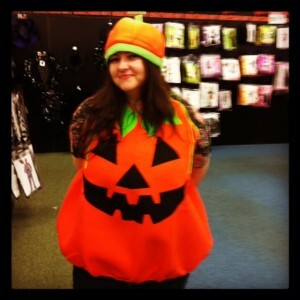 Jacqui – Fave Fall food in general is roasted squash! Caramel Apples are a close second. 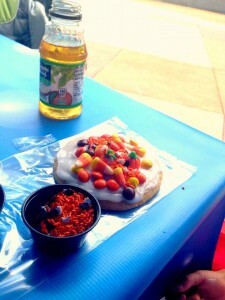 Kelly – I love the pumpkin waffle that they have at Sleepy Hollow during MNSSHP. And I never turn down apple cider. Gail – My favorite fall food is the pies, sweet potato or pumpkin pie, I love how much pumpkin flavored stuff they do! My favorite drinks are the spiced ones, so pumpkin spice or apple spice, they really taste like fall to me! What is the movie you are most looking forward to seeing in theaters between now and the end of the year? Betsy – My heart is completely torn in half on this one. Two of my greatest loves in Star Wars and James Bond, also two of the best film franchises in history, are both releasing films between November and December. SPECTRE looks like it is going to be amazing, but The Force Awakens will probably win the year’s box office if it is half as good as the previews look, plus BB-8! Jillian – Star Wars: The Force Awakens! Shelley – Star Wars: The Force Awakens! It will be Zoe’s first Star Wars movie on the ‘Big Screen’!!! Dana – Star Wars, of course! Jacqui – Love Bill Murray and love The Jungle Book, so I can’t wait for this one in October. Kelly – Other than the obvious, Star Wars, I’m looking forward to seeing The Martian. Gail – A movie I’m looking forward to is Ant Man, I know it’s terrible I haven’t seen it already! I am almost out of time but hoping to catch it, it looks fun! I really love Disney Movies Anywhere (DMA), and it has really been a lifesaver when Zoe NEEDED a movie to watch when we are On the Go. And now Disney Movies Anywhere now offers consumers even greater access to their digital collections of Disney, Disney•Pixar, Marvel and Star Wars movies at home and on the go with the addition today of two new retail partners, Amazon Video and Microsoft Movies & TV to its robust digital footprint. DMA is already available via iTunes, Google Play, and Walmart’s VUDU, and adds more devices next week as Roku and Android TV come on board. What’s even better is that you can now watch MARVEL’S AVENGERS: AGE OF ULTRON wherever you go with Disney Movies Anywhere (DMA) on September 15th! 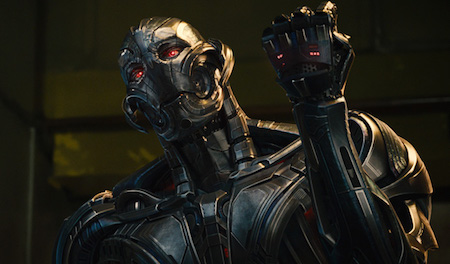 “Connecting the Universe,” an exclusive feature that explores the epic network of intertwining story lines in the Marvel Cinematic Universe, highlighting the intricate links between the worlds of the MCU characters and their comic history.